Image caption Lucy Rose: "I was sleepwalking through life before I heard my own lyrics." Plenty of songwriters describe their music as therapy. 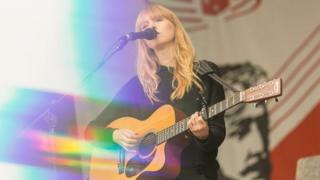 Lucy Rose says writing her fourth album inspired her to find a therapist. Called No Words Left, it's the singer's starkest, loneliest album to date; filled with lyrics about anxiety and helplessness that spilled out, unbidden, in a studio in Brighton last summer. Rose was often "so consumed by my feelings that I was unaware I was writing a song". On Pt 2, she found herself literally lost for words, her emotions bursting forth as a desolate, woebegone cry. "I'd never imagined myself singing like that, ever," says Rose, explaining she recorded the vocal at her lowest ebb. "It was so bad I'd been almost silent all day. Barely, barely communicating. "Then that evening I said to my producer, 'I want to try something,' and... God, I felt like something was being released in me. "For the first time, I felt like I could describe what was going on inside with that song." But it was only when she played the album back that Rose realised how fragile she'd become. "I was sleepwalking through life before I heard my own lyrics," says the 29-year-old. "I realised that something wasn't quite right." Rose is keeping the specifics of her depression to herself; but there was no great calamity that pushed her over the edge. She talks instead of the cumulative effect of spending years on the road while surviving career knockbacks and dealing with a propensity towards anxiety. To the outside observer, her career was going well. Having negotiated her way out of a major label contract and reclaimed control over her career, Rose noticed her songs were doing well in South America, and plotted a tour of rarely-visited cities in Peru, Chile, Argentina and Ecuador, staying with fans who'd agreed to put her up. The trip inspired her first independently-released album, Something's Changing, but somewhere along the way, she began to feel that "if every gig and every song and every note wasn't perfect, then I'd somehow failed". Pre-show drinks with her band were ruled out in case they affected her performance; and she'd spend tour nights sitting in Travelodge baths "over-analysing the gig in every way". On top of that, her 30th birthday was looming on the horizon. "I always thought, 'By the time I'm ready to have kids, I'll be on a tour bus, life will be easy,'" she says, "but I still find myself at 29 crashing on people's floors and sofas and worrying that this isn't sustainable." Last May, after wrapping up her longest-ever tour, Rose suddenly found herself with no distractions and nowhere to hide. "It just got bigger and bigger and bigger. Things started attaching themselves to other things, and I realised I couldn't solve any of it." When the album crystallised those problems, Rose finally sought out a therapist. She's too smart to romanticise the idea of the "tortured artist" whose best work is excavated from deep reserves of emotional turmoil, reasoning that "music can't be above my happiness, which I've allowed it to be sometimes". "I guess the silver lining is that there's a record which maybe helps other people - but, definitely, I wouldn't want to go back." Released last Friday, No Words Left has attracted some of the best reviews of Rose's career. The Guardian called it "bleak and beautiful"; while DIY observed, "this is a record that will resonate with anybody rebuilding themselves in the aftermath of self-doubt". "Rarely has a dark night of the soul ultimately sounded so uplifting," added The Arts Desk. It's certainly an album that deserves your undivided attention. Rose's songs shimmer with subtly-bowed strings and delicately-plucked guitars that swell to meet her vocals. At just 35 minutes, the record is artfully sequenced as a beguiling song suite - something of a lost art. "Back in the days of being with a major [label] it was like the hits came first and everything else, other than those three singles, really didn't matter," recalls Rose. "This album was almost the opposite of that. It was about the whole thing making sense." Rose spent more time than ever getting the details just right. Her vocals were recorded up close for added intimacy, for example, and she'd use different bass amps from song to song to ensure each one had its own texture. "Because there's less going on musically, I felt like everything was more exposed, so it had to be the very best," she explains. "I wanted every instrument to express something beyond what I could express within my lyrics and melody. I wanted the strings to have room to grow and blossom and be descriptive." Notably, none of the songs feature drums, making it a hard sell for radio, so Rose was surprised to hear the first single, Conversation, cropping up on the beat-obsessed Radio 1. "And then, yeah, Annie Mac played it a few times and 6 Music have playlisted it, and that's just been totally, totally shocking." Early sales figures suggest No Words Left will give Rose her third top 20 album this Friday. And, having survived the process of making it, she's taken steps to protect her mental health on the road. "Normally I'd play about a month in the UK and I'm only doing eight shows this time. Same in Europe," she says. "It's difficult because you feel like you're letting people down - but it means that I feel like I can see a future in it." She's also being bolder about making the shows creatively satisfying, employing a string section to replicate the delicate arrangements of the album. "I've never really taken myself very seriously, in a weird way, as someone who deserves it," she says. "This time, I decided I'd earned the right to have brilliant musicians around me, so that every night on stage I feel truly fulfilled. "Because who knows what chance you'll get to do these things again?" If you have been affected by any of the issues raised in this story, support and advice is available via BBC Action Line.